These feet are made for walking & they bear the load of our entire body throughout our lives. Our divine Foot Massage helps to unknot, unblock & unravel tortured body tendons using precise pressure techniques to the reflexes of the feet which may represent all the organs & systems of the body to help induce deep relaxation & relief. Give your feet a break; take the weight off your feet & blissfully lavish yourself!! Let our fingers do the walking on your feet!! Reflexology is a holistic therapy suitable for all ages, and may bring relief from a wide range of acute and chronic conditions. 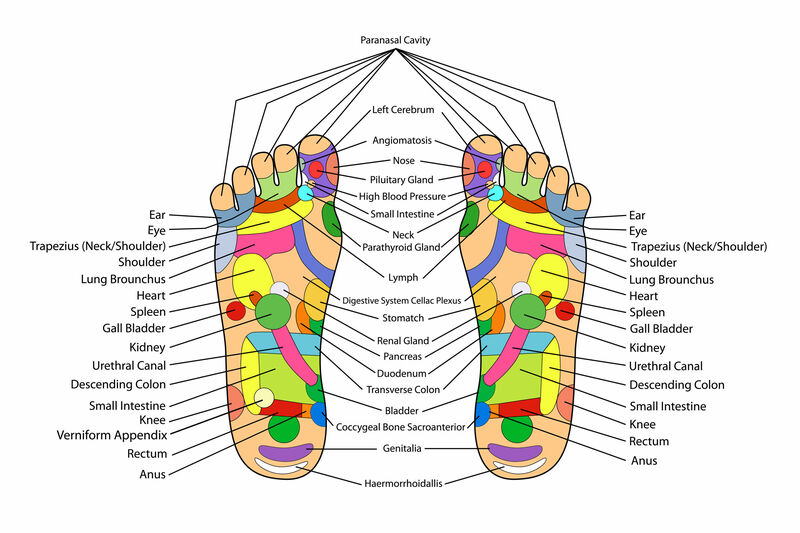 It is an alternative, holistic and non-intrusive complementary health therapy, based on the theory that different points on the feet, hands, face or ears and each have areas called reflex points which are believed to each correspond to organs, glands, and other key areas and different systems of the body. Supporters and pro-reflexology advocates believe that pressure applied to these reflex points on feet, hands, ears and face areas with specific thumb, finger, and hand techniques affects the organs and benefits the person’s health. This also helps the body to restore balance and well-being by activating the body’s own healing processes. Some schools of thought also think that reflexology may help reduce pain and psychological symptoms, such as anxiety and depression, and also enhance relaxation and better sleep. This is based on the theory that the body’s energy pathways begin in the feet and any blockages can cause ill health and disease. Most times some people may fall asleep during a Reflexology treatment and this ‘nap’, short as it might seem, can be more beneficial than having a full long night’s sleep. Some schools of thought sate that Reflexology simulates over 7,000 nerves in the body and promotes homeostasis which is the body’s natural way of bringing the body back into balance and refreshing the bodily systems, as well as clearing out toxins within the body and encouraging the release of endorphins. Reflexology is not a diagnostic treatment or a substitute for any conventional treatment that a person might be receiving from the doctor, and Bliss Fountain strongly advise people to consult their doctors regarding any persisting conditions. During the session, some people may feel tearful, thirsty, feel sleepy, or perspiration of hands or feet, or a sensation of being cold or chilled, as well as feeling light-headed or tingling in the body. Other people may feel like coughing, laughing, sighing deeply, and a feeling of warm energy moving to some body areas or organs, and a general sense of relaxation. This is all part of the healing process since reflexology helps the body to nurture and repair itself once released from stress, pain and discomfort. Some people might experience a physical perception of energy flowing through some body organs, valves, glands, or muscles, and this prompts a sense of communication between each body system, resulting in loose, relaxed muscles, as well as reduced pain and discomfort. Tiredness – some people might need more sleep in order for the body to rest and repair, and this might result in enhanced sleep, and increased energy. Frequent bowel movements, due to the cleansing and elimination of toxins. Some clients might get temporary skin rashes, pimples, or spots due to elimination of toxins. Flu-like symptoms, and Emotional or psychological release. At Bliss Fountain, we recommend that you drink lots of water to help the body flush out the toxins, and we also recommend plenty of rest immediately after the reflexology treatment, and having an awareness and good attention to your body in order to aid the body in the healing process.